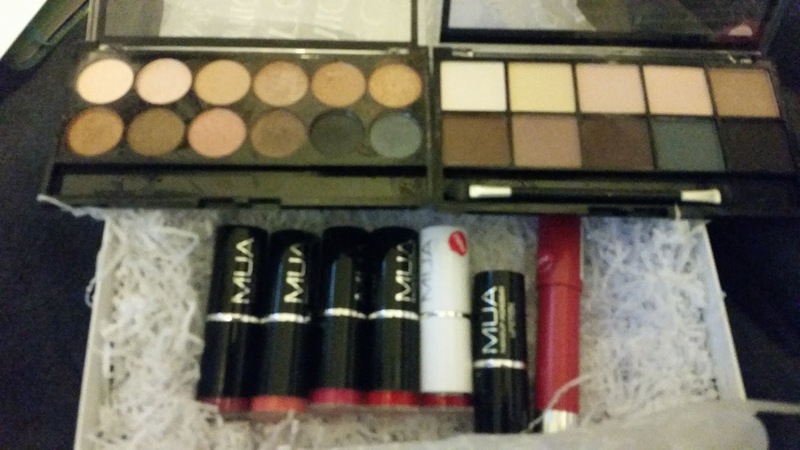 Back in May 2015 I shared my MUA addition collection and I thought it was time to revisit it by way of a re-haul. I rooted out all the MUA products I've still got and honestly there must me more of it somewhere as I feel like I had so much more. I know I had to get rid of one of the pallets (undress me too - I think) as I managed to smash the black shade and it went everywhere. What Do I own now? Undress me - I do like this but preferences undress me too which I am tempted to repurchase. Matte pallet- not a massive fan of this . The pigmentation just isn't there for me. Various lipsticks- these are great £1 each and some lovely colours. I just don't wear them. My favourite shade isn't pictured and that's shade 11. It's a really.good day time colour and I've had 2 of them as one snapped. Lip Chubby - the name of this has worn off but I'm not a massive fan. It's a very bright pink and the crayons itself is unstable and I think it's snapped at the base. I really don't use any of these products very often and since deciding to do an MUA rehaul I've visited the stands in various superdrugs but haven't been tempted to buy although I have recently seen someone mention a foundation from them but do I really need any more? What was in the previous post? Undress me too -love this sadly I smashed the black shade and decided to throw it away as it was too messy. Mega Volume Mascara -I really don't remember this. Eye Primer -really liked this and I might repurchase if I see one. Mossaic Blush - I'm not sure I ever used this and I have no idea where it is. Undress Your Skin Primer - a huge dislike for this. It's very silicone-y and I could feel it all day. I don't feel like it helped my make up stay on. Matte Foundation 03 Gentle fawn - amazing foundation. A good match to my skin at the time. I would be tempted by this again. Various Lipsticks - great value but sadly under used by me!